Directed by Chris Kozak. 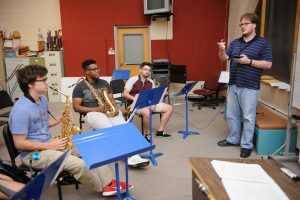 The UA Jazz Ensemble provides a professional atmosphere for students interested in the many aspects of jazz. This award winning group has performed at numerous jazz festivals, including: Notre Dame Collegiate Jazz Festival, Mobile Jazz Festival, Wichita Jazz Festival to name a few and performs throughout the region in schools and conferences. Its repertoire covers musical styles from the 1940s to contemporary arrangements, including those written and arranged by students. This group is the nucleus for the Hilaritas ensemble. The Jazz Ensemble is open by audition to any student, regardless of major. Directed by Mark Lanter, Tom Wolfe, and Chris Kozak. This group is an off-shoot of the Jazz Ensemble. Each spring semester, this ensemble performs a lecture concert focusing on music from the jazz repertoire that is not as familiar as the standard repertoire. Performing several times during the semester, this group is frequently called upon to perform at specific academic and social events for the University. 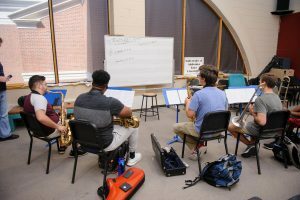 Directed by Mark Lanter, Dan Kolan, and Rob Alley, these groups offer the students the opportunity to develop their improvisation skills and learn basic jazz repertoire and jazz performance practices. The Jazz Combos and Jazz Band are open by audition to any student, regardless of major.